Above an illustration of the decline of seaweeds: Juicy whorl weed Chylocladia verticillata all white and fuzzy (see for a more healthy looking plant this post from 2.5 months ago) on a bed of the common and pretty Discoid fork weed Polyides rotundus. There seem to be around 25 or so (larger) species that are common in these pools. 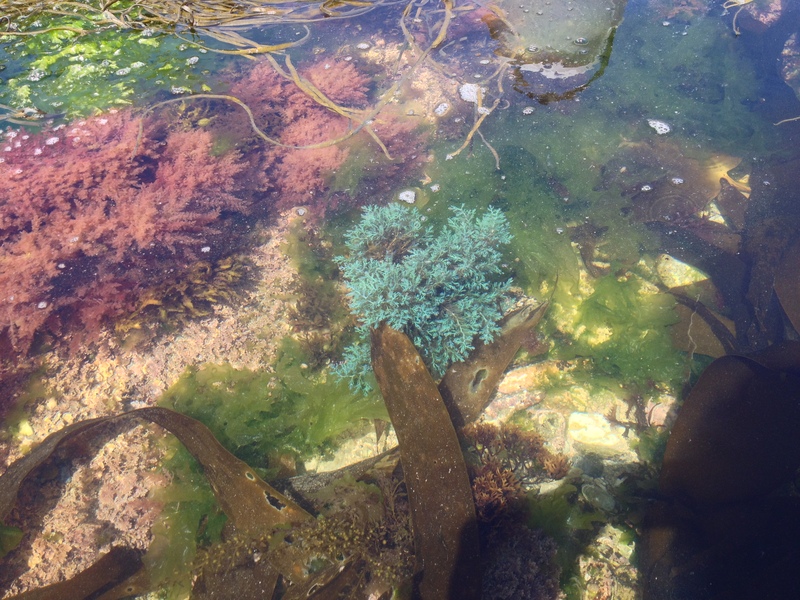 Many of them can be seen in the two photos below (including a stray Bladder wrack, a species that dominates the shore just a meter higher): Below, a whole bunch of individual species. 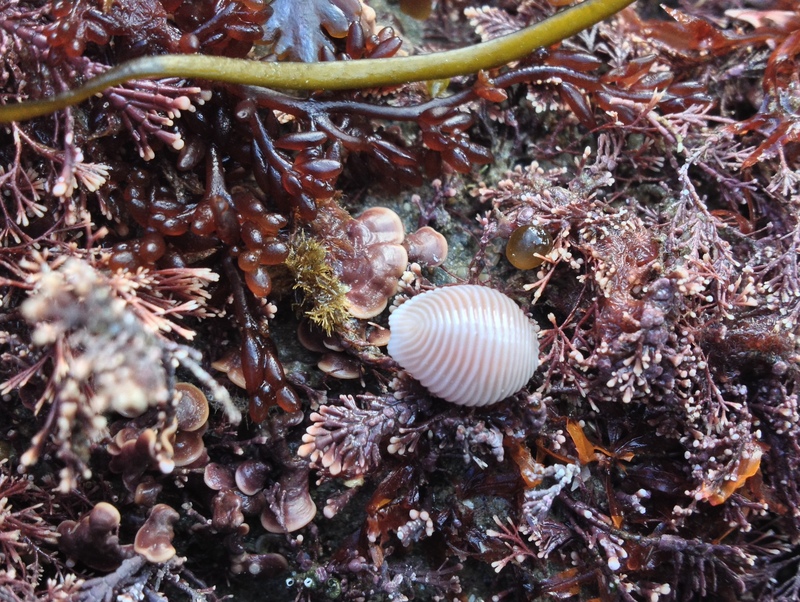 First, Sea beech Delesseria sanguinea, which must have washed up from under the kelp beds (too bad I did not get the entire plant in frame…). Second, a photo of Ulva with Chipolata weed Scytosiphon lomentaria. Third, the brown Divided net weed Dictyota dichotoma. Fourth, Slender wart weed Gracilaria gracilis. Fifth, False eyelash weed Calliblepharis jubata; this plant has grown quite large and has turned from dark red/brown to a much lighter brown. Sixth, the Falkenbergia stage of Harpoon weed Asparagopsis armata (see the third photo) on the right. Seventh, Red grape weed Gastroclonium ovatum. 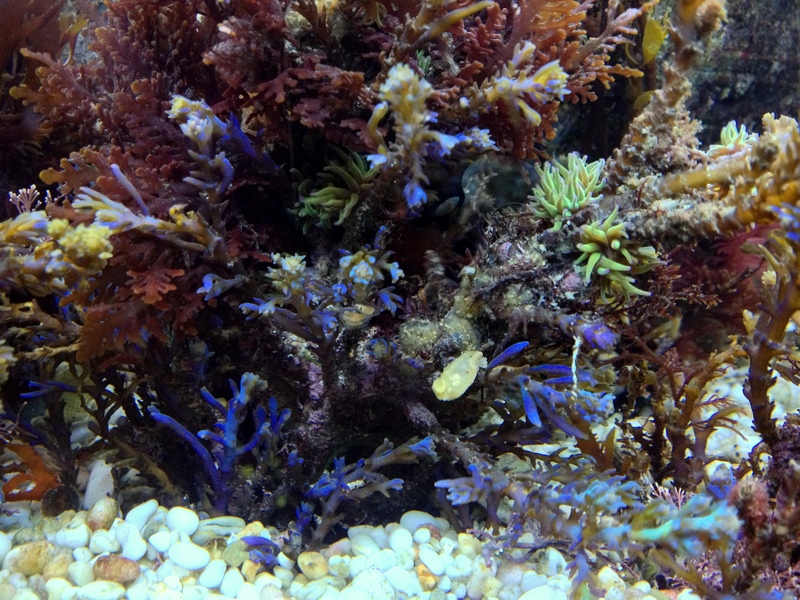 Finally, two photos of my favourite species the blue Bushy rainbow wrack Cystoseira tamariscifolia. 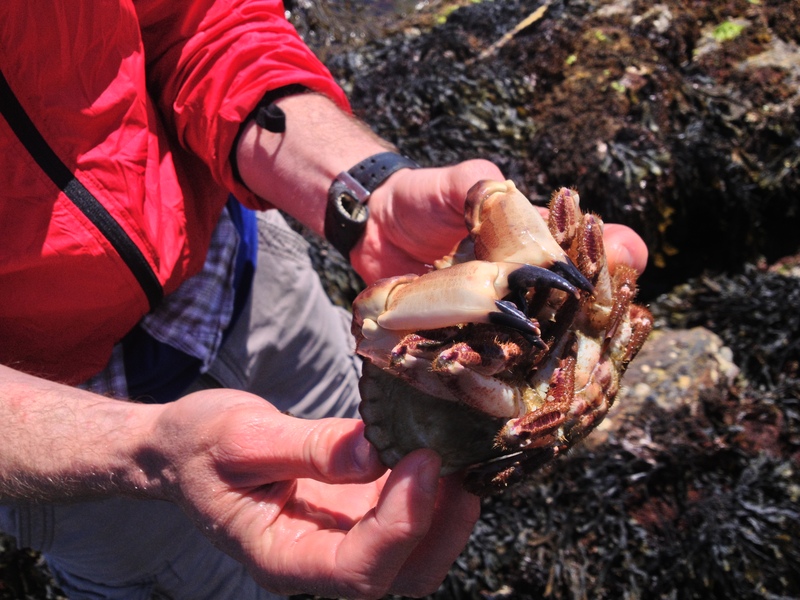 Last weekend I went down to Gylly Beach in Falmouth for a bit of rock pooling. However, the tide was not very low (especially with the inshore wind) and the weather was crap. 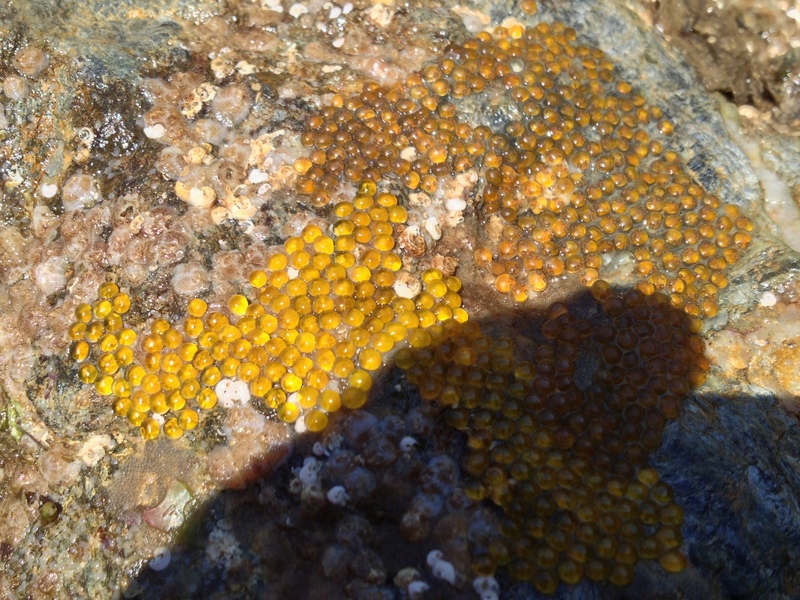 Moreover, I could not find anything that I had not seen many times before; although rock pool life is very biodiverse, there have started to be dimishing returns when looking for non-microscopic organisms. Clambering over yet another rock, I decided to stop and play around with my Canon Powershot instead. I focused on a tiny pool (around two by four feet) completely covered in corraline algae. It does not look like much but taking the time for a carefully look was really rewarding. It is tricky to take photographs without being able to see the viewfinder though. My strategy has been to just take loads of pictures and hope some of them work out. 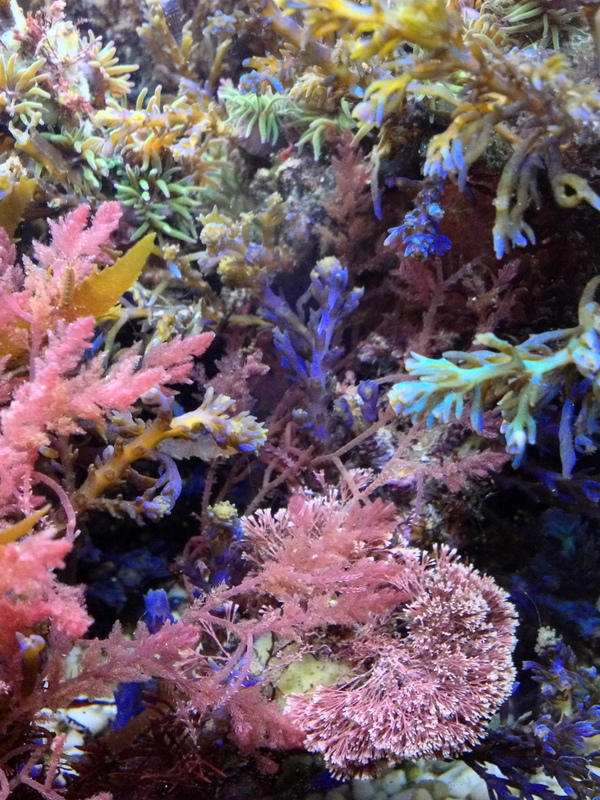 The miniature underwater landscape was really beautiful. 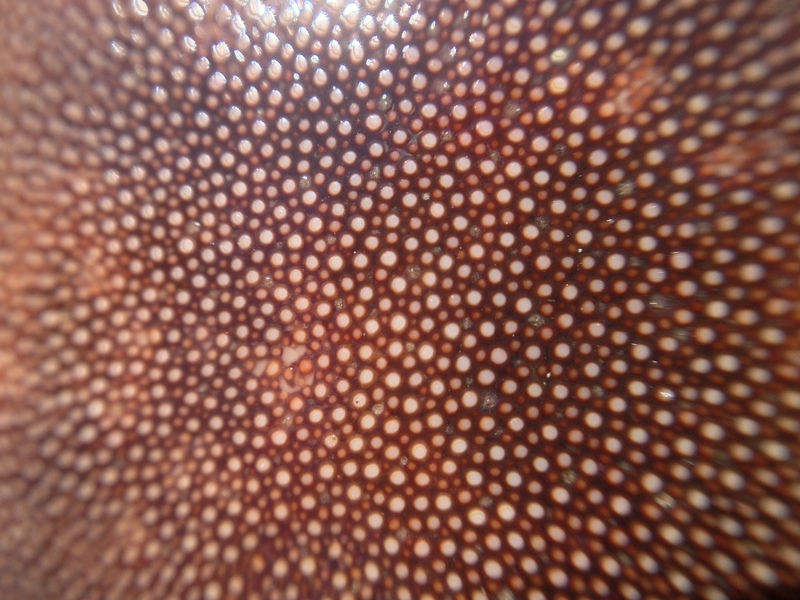 Pink plates Mesophyllum lichenoides made up the largest proportion of corraline algae (some bearing ‘reproductive conceptacles’). Another species is Corallina officinalis or Common coral weed (third photo). 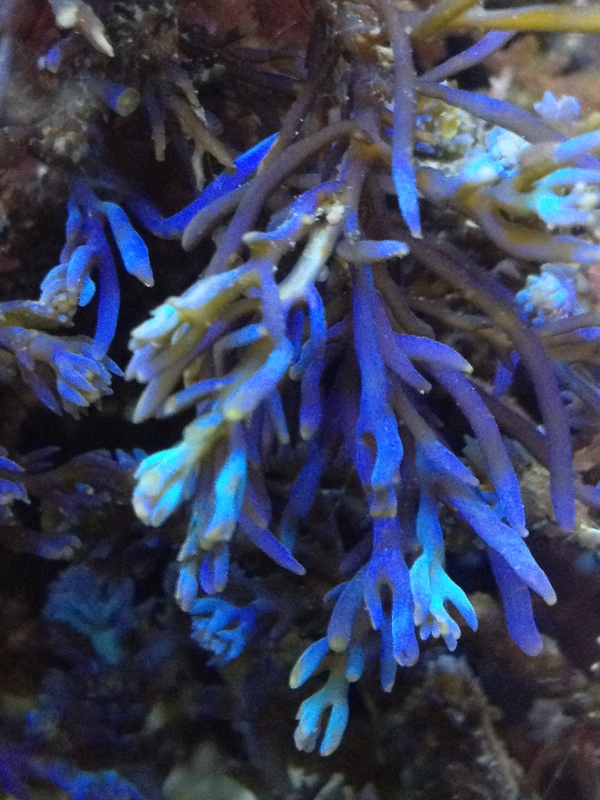 I had some Corallina growing in my aquarium at some point, but it grew very slowly and has now disappeared. 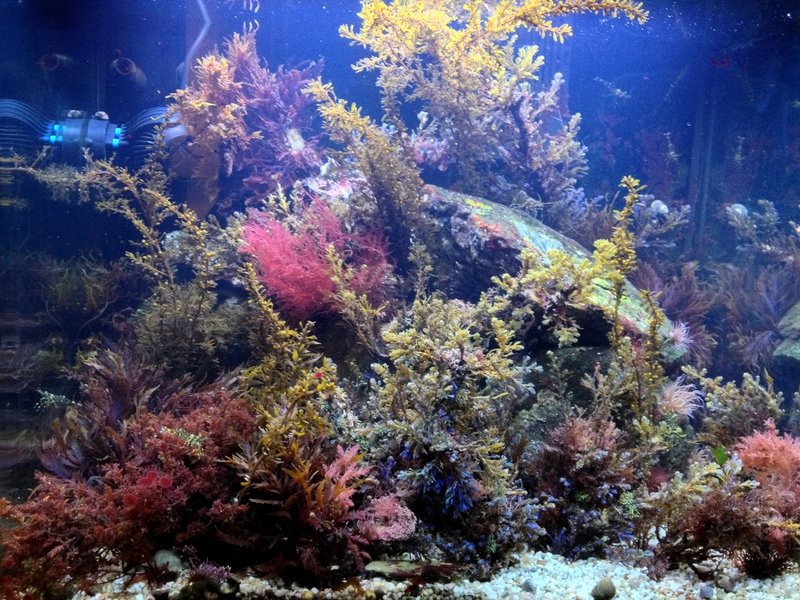 Being able to create the right conditions for coralline algae to thrive in a coldwater aquarium would be fantastic, but I have not seen any evidence of anyone being able to cover their aquarium in them yet. 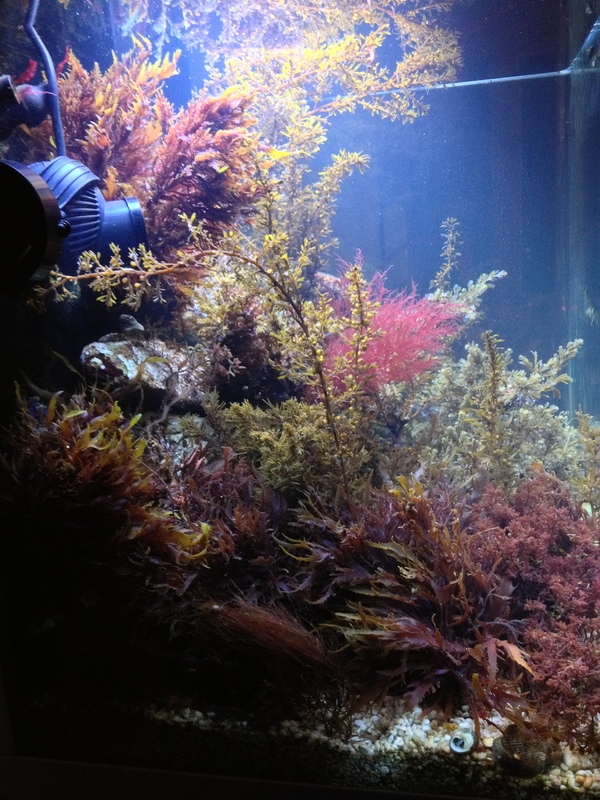 (I have tried ‘planting’ Corallina and although it looked very nice at first (fifth pic), these seaweeds quickly died off, turning orange and then white (second pic).) 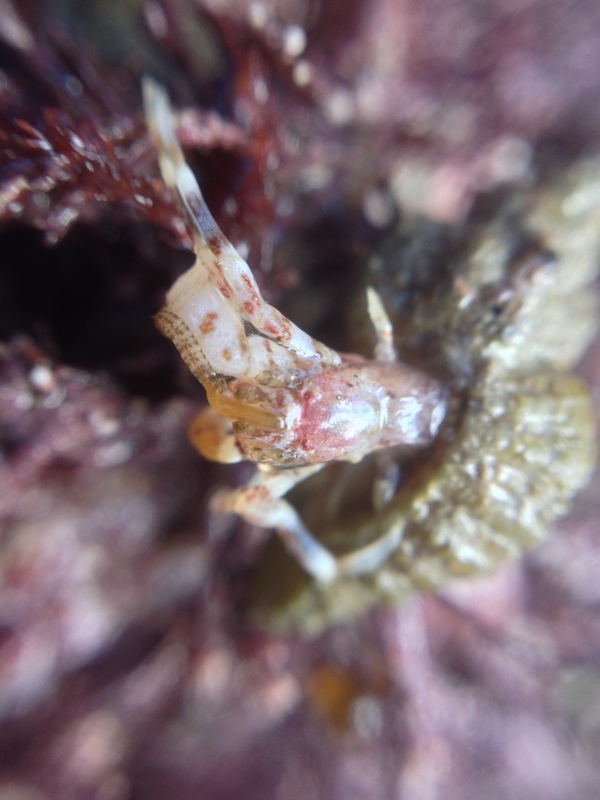 Some other seaweed species were present as well; Irish moss and Harpoonweed (not pictured), False eyelash weed Calliblepharis jubata occurred in multiple patches, Rhodophyllis divaricata?, an Osmundea species and Red grape weed Gastroclonium ovatum. 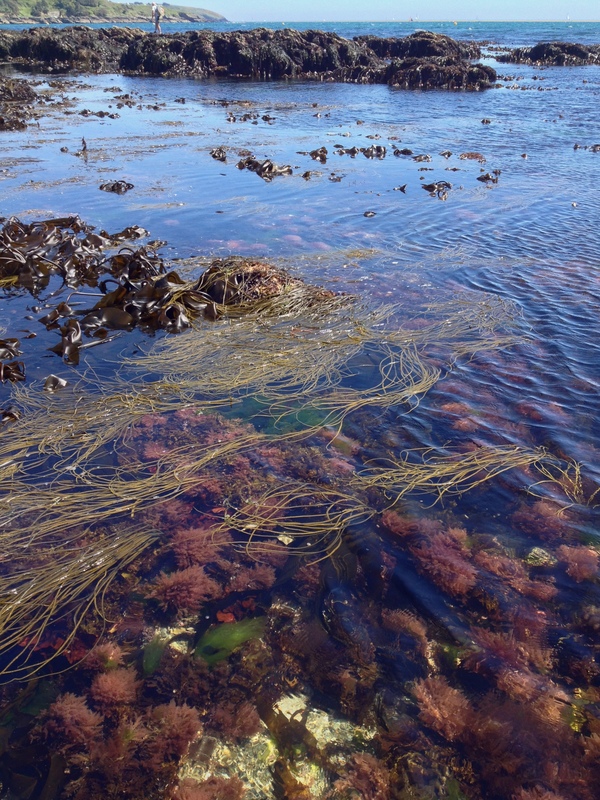 There were also a few brown seaweeds, the characteristic Thong (or Spaghetti) weed Himanthalia elongata buttons and the invasive (and pervasive) Wireweed Sargassum muticum. 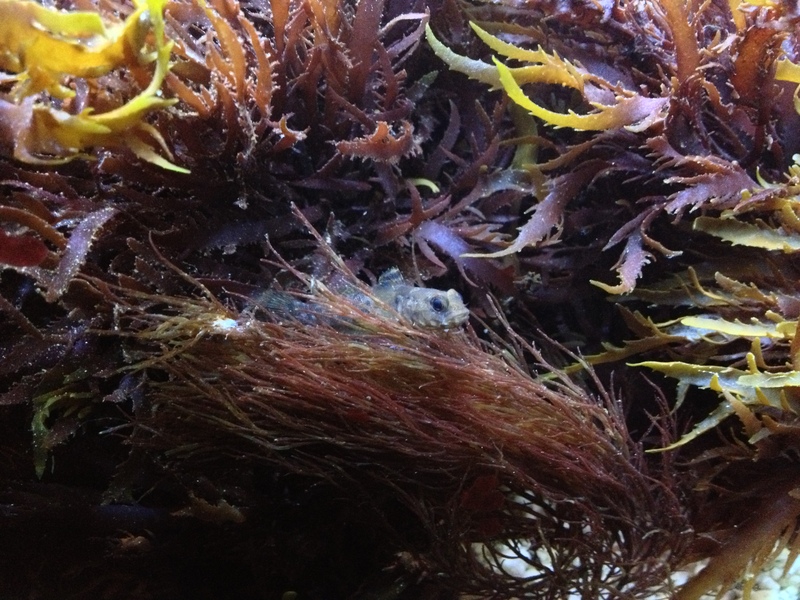 I did not spot too many animals, although I am sure there is an enormous hidden diversity present among the seaweeds. I noticed a red-white Dahlia anemone Urticina felina as well as some patches of a colonial brown tunicate. I’d like to go back soon and take some more pictures, with my Canon powershot or with my GoPro. I have an SLR as well that I have not been using lately as my iPhone is such a good camera and hassle-free. SLR underwater housings are really expensive, but I recently discovered that there are quite cheap waterproof SLR bags available which might be an option to try to take higher quality photos (in rock pools, I would not go diving or snorkeling with them). 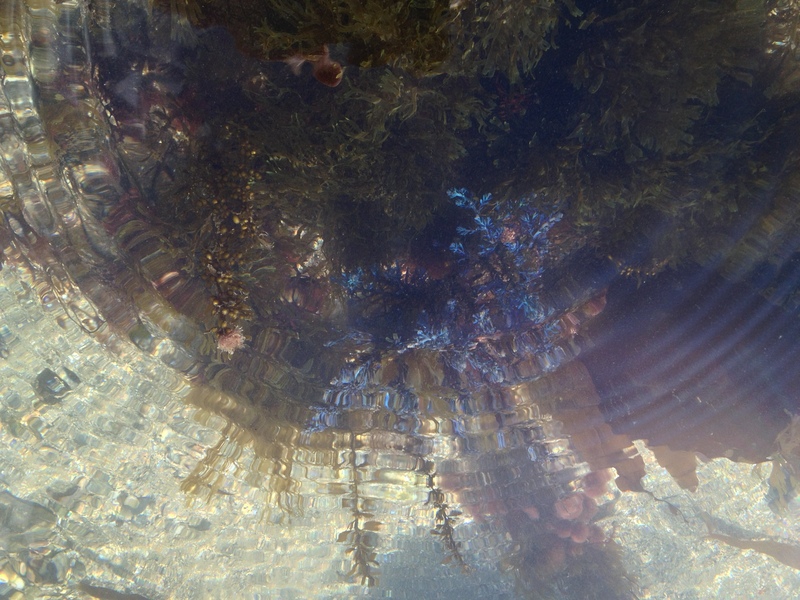 It would be very cool to try to make panorama pictures of rock pools, especially when taking one each month in the same spot to capture seasonality. More seaweed photos, Canon powershot or otherwise, to follow soon! The lowest tide of the century so far, on a Saturday, with beautiful weather and on a stunning location: what could go wrong? Very little! 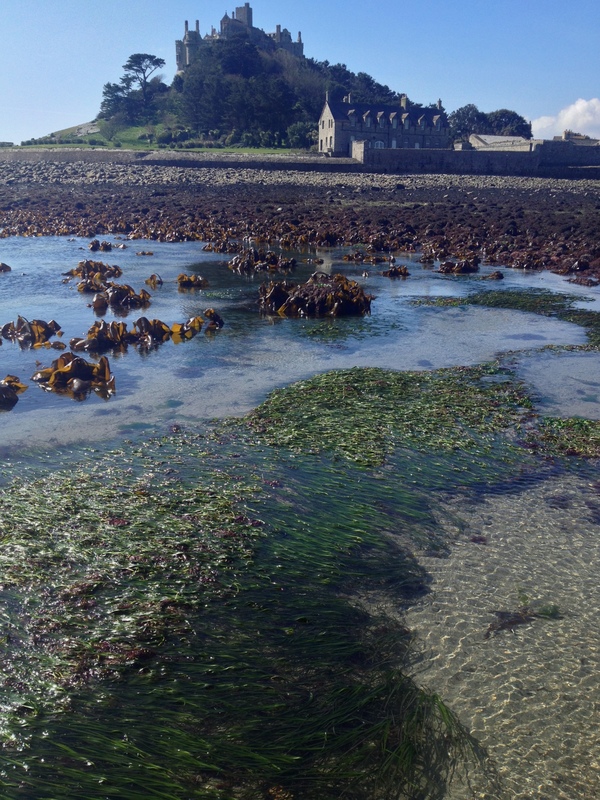 St. Michael’s Mount, Marazion, Mount’s Bay is one of the most beautiful spots in Cornwall and an excellent site for rock pooling with a mixture of eelgrass beds, rocks and sandy expanses. I felt like a kid in a candy shop: wanting to turn every stone, photograph every seaweed and inspect every gully before the tide would come back in. I needed to collect some more Clawed fork weed Furcellaria lumbricalis for a cool student project. That was abundant so easy to sort. Chock full of Pheasant shells Tricolia pullus. 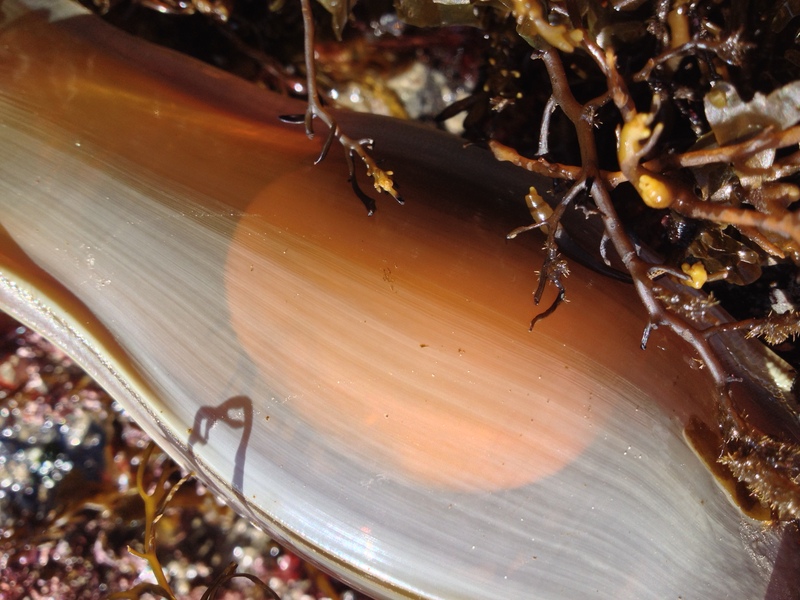 One other amazing thing was that the place was littered with Bull huss Scyliorhinus stellaris (a.k.a. Nursehound, a.k.a. Large-spotted dogfish) mermaids purses. 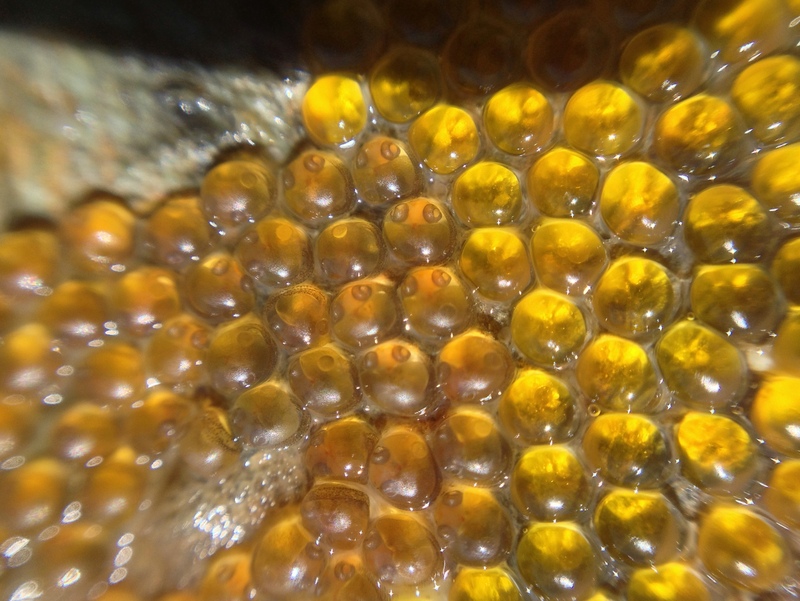 Mount’s bay is an important breeding ground for these sharks. 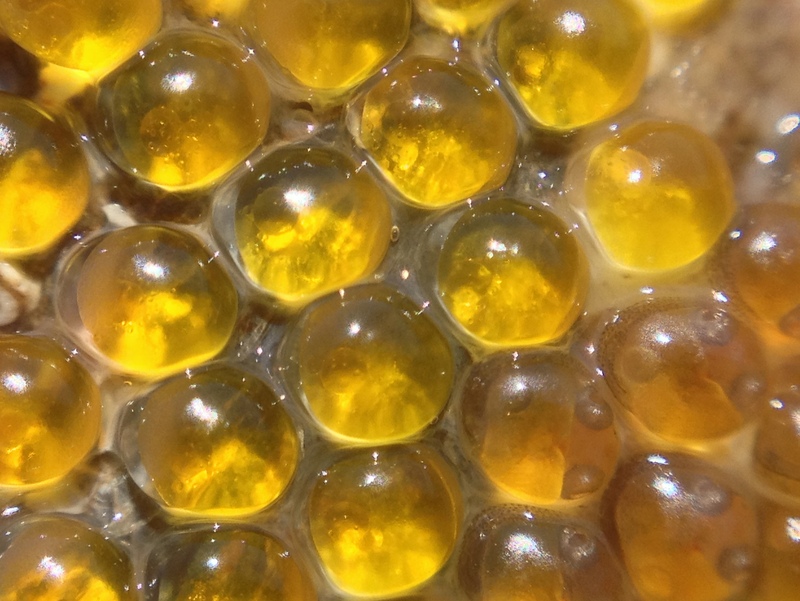 The yolk was easy to spot, but the embryo’s still to small to be seen. 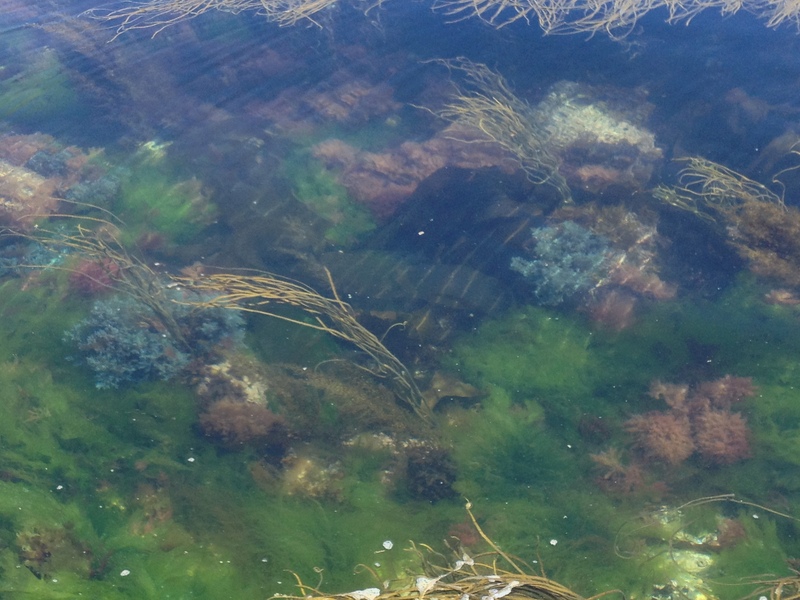 There were loads of pretty seaweeds gently waving among the eelgrass in the crystal clear water. I saw a bright green Chameleon prawn swimming about, but the picture I took was a bit underwhelming. I had met up with David Fenwick, so could get all species identified on the spot. Very striking was a great amount of small, fuzzy pink seaweed balls: Falkenbergia, the tetrasporophyte stage of the Harpoon weed Asparagopsis armata (it looks so different from the gametophyte stage, see some old posts, that it was long considered a separate species). 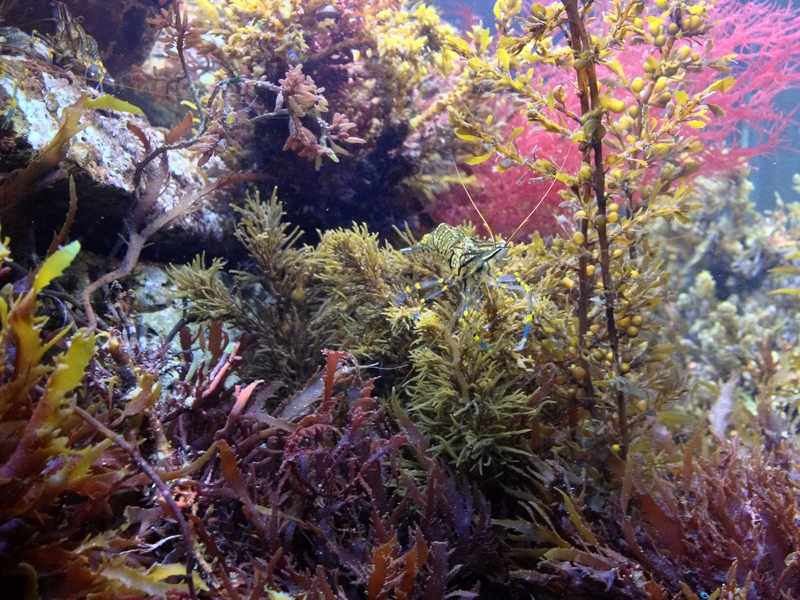 Also, a picture of Bushy rainbow wrack Cystoseira tamariscifolia, simply because one cannot post too many pictures of Bushy rainbow wrack…. The find of the day (the month probably) was a Little cuttlefish Sepiola atlantica. 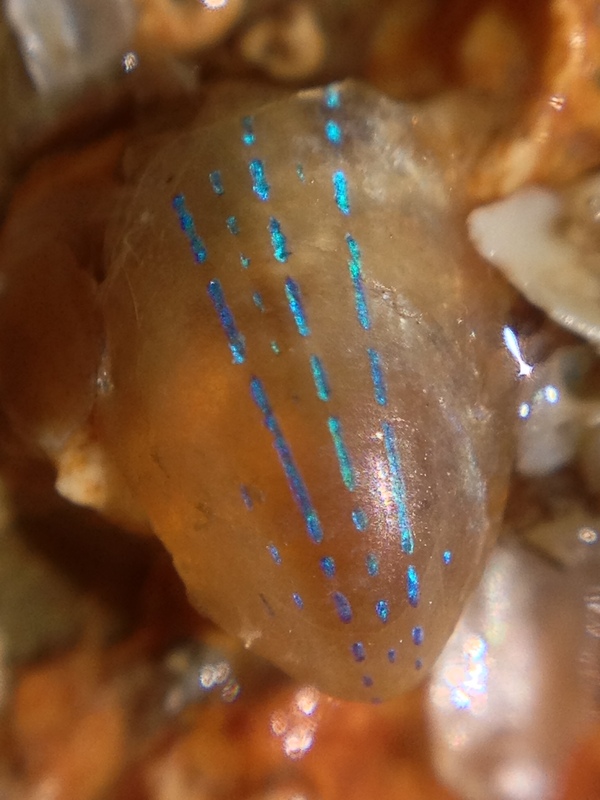 This picture is crap, but David has made some stunning photos back in his lab and they will appear sometime soon on his aphotomarine site I am sure.